Before I get to this issue, isn’t it just impressive that this book has had the same writer and artist for ten issues straight, and the book has remained on time? That rarely happens now (unless your artist is John Romita Jr. or Mark Bagley) in either Marvel or DC titles, and even Image titles need to pace themselves out. Now to issue #10. The current Black Widow series has been an interesting read since it launched. Following Natasha as she wants to make up for her past sins by taking some odd jobs as an agent for hire, and donating her earnings to various charity organizations has made for a compelling read. This series has followed the growing trend in Marvel Comics to have their on-going series consist of done in one stories that follow their own continuity and barley connect to the larger Marvel universe. I like this trend overall, but I do appreciate when an ongoing has a single story stretching through the series. Lately, that’s what this book has been doing. Black Widow has been tasked with tracking down a traitor within S.H.I.E.L.D., but at the same time her attorney Isaiah has been abducted by a mysterious party. This issues jumps back and forth between what’s going on with Isaiah, as well as a past mission Natasha had that influences the current story. The first image in this article best summarizes Isaiah’s section of this story. As for Natasha’s section, it’s a fast paced action scene involving Black Widow trying to get an accounted out of danger while an unknown assailant follows them. The person following Natasha remains hidden for most of the beginning, with the suspense built up well (you know, if you ignore the COVER). This leads to an effective reveal scene as to who’s on her tail (cough…cover…cough). The resulting fight scene is fast paced, inventive, and exciting throughout the issue. 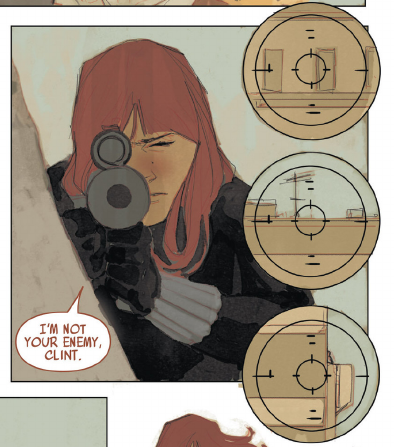 Natasha uses her gadgets and rifle skills to keep Clint on his toes, whereas Clint uses his hightech arrows to keep Natasha distracted while he goes after his target. The entire fight takes place on the rooftops as they swing, jump, and tightrope their ways into the best positions. While some of the scenes in the book can look cluttered and chaotic at first glance, Phil Noto makes it very easy to follow. His artwork is very fluid, and his character expressions are spot on. 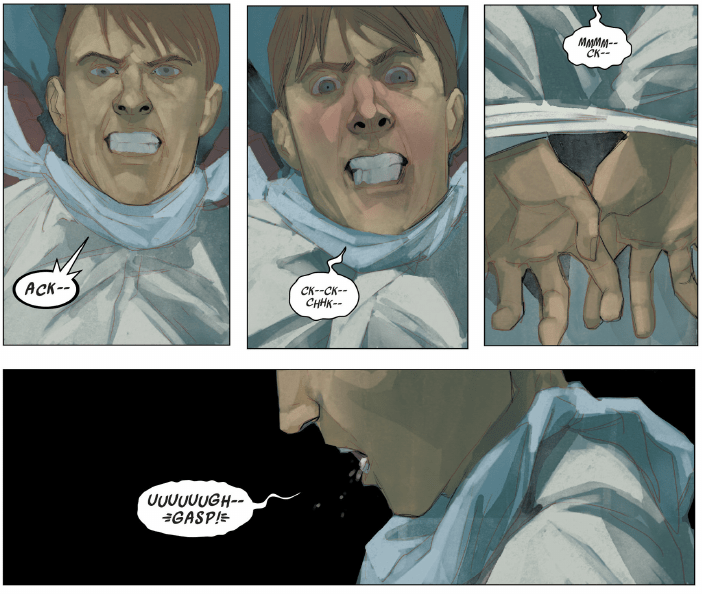 Phil Noto is also able to cram as much information as he can both in each panel, as well as adding smaller images to increase the pace of just one panel. The writing of this issue is also very impressive. Nathan Edmondson gives Natasha a very reserved way of speaking, not showing a lot of emotion, but still desperately wants to make up for her past mistakes. There is very little dialogue during the Natasha section of this issue, but that is understandable since this battle needs to be fast-paced. The Isaiah section on the other hand is primarily dialogue, and can get pretty tense at times. Isaiah has proven throughout this book that he is not just an attorney, can be pretty scary, and is quite tough in his own rights. He continues to prove that he is not an easy nut crack, but he has a lot against him right now. The villains are instantly hateable, giving incredibly smug speeches that make you fear for Isaiah. The writing is not all doom and gloom though, Nathan Edmondson has his own brand of humor that he peppers throughout the book. What If You Get Hit By A Satellite? Not much negative I can say about this issue. The art is crisp, the writing enjoyable, and this issue keeps the story going at a good clip. The only negatives I can say is that some sections can get a little hard to follow (only slightly), but other than that nothing. Black Widow continues following the life of Natasha when shes not doing Avengers related business. This issue also follows the series current trend of working as a done in one, but at the same time adding to a larger story. If you have not been reading this book, I recommend checking out the first trade and then catching up to this issue. If you have been following this book, this issue does not miss a step from the rest of the series.